What Does the Man Pay for When He Gets Married? In some cases, the groom pays for the bride's bouquet. The rules about who pays for what when a couple gets married have become more flexible over the years. While traditionally the bride's family paid for the bulk of the expenses, at the time of publication, nearly 70 percent of weddings were paid for by the couple, according to The Emily Post Institute. The groom has some financial responsibilities even for a wedding that is paid for the traditional way. The groom traditionally pays for both the engagement ring and the wedding ring for the bride. Of the two, the engagement ring is the more pricey investment. According to a 2011 survey from XO Group, Inc, the average engagement ring costs $5,200. The cost of the average woman's wedding band was $1,126. The price of the rings depends in large part on the taste of the couple. 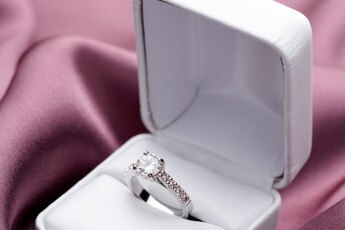 It's possible for a groom to spend more than $13,000 on a very high end ring, according to the survey. The groom is usually expected to purchase a gift for his new wife. He should also purchase gifts for his best man and groomsmen to thank them for sticking with him before, during and after the ceremony. The gifts don't have to be very elaborate, but should somehow reflect on the couple's relationship or the relationship of the groom with his friends. 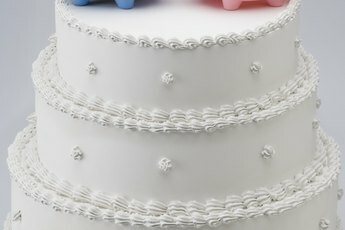 Grooms in some parts of the U.S. are also expected to pay for the bride's bouquet and corsage, according to MarthaStewart.com. They also usually pay for boutonnieres for the groomsmen and corsages for their family members. Men traditionally pay for the cost of the marriage license and the fee for the wedding's officiant. The marriage license cost varies from state to state. In New York state, for example, a license costs $40 outside of New York City as of 2012. Inside the city, the license is only $35. Fees also vary among officiants. A groom might pay for the officiant's lodging and transportation if he needs to travel and stay over night. The cost of the honeymoon typically falls on the groom. The groom's family might help pay some of the costs for the honeymoon if they wish. Honeymoon costs usually include transportation to the destination, the cost of lodging while traveling and the cost of meals. If the groom plans any activities during the vacation, he should pay for those as well. Costs can vary greatly depending on the destination and the type of transportation used to get there. Martha Stewart Weddings: Who Pays for What at a Wedding? What Is a Food Budget for a Family of Four? How Much Money Are Bridesmaids Expected to Pay?